I note that they market a number of additives (and often include these additives as suggested ingredients in their featured recipes) for example "Roll Dough Improver;" "Rye Bread Improver;" "Whole Grain Bread Improver." The web site does not disclose the components of these commercial additives. The advertising photographs give no additional information beyond the names of the products. To find out what's in any of them, I gather one must purchase the item and then read the label. I'm all for anything that improves/enhances a recipe, but even as a novice baker I would prefer to know how to achieve that improvement myself and know what the enhancement should be expected to accomplish, and why. In the case of "Roll Dough Improver" the item is advertised as an additive to make it easier to roll out dough that otherwise is difficult to handle. The agent apparently is a "dough relaxer." I gather the rye and whole wheat recipe "improvers" include seasonings but perhaps other components also. One can only guess. I would like to know what opinions are held by experienced bakers frequenting this site as to whether they have used these products and found them worthy. Are they impossible or impractical to duplicate in their own kitchens at home? Would any respondent be willing to suggest specific itemized "improvers" and "relaxers" one can add instead of the commercially available products? Philosophically I would prefer ingredients I can add myself in quantities I choose when and where to vary, to remove the mumbo-jumbo and return to the baker the satisfaction of achieving the results personally with as much individual control as possible. Or can you refer this reader to literature which deals with this? Related question: I see no reason to purchase small quantities of sourdough starter commercially unless one intends to bake sourdough bread only sporadically. Can anyone offer an additional advantage? ... don't want the flexibility to achieve results independently, and don't want to spend valuable time "reinventing the wheel". They have no interest in "the satisfaction of having done it themselves". They just want a product that solves their problem, and that a "grunt" who's only following instructions has no opportunity to mess up. "Just throw this packet in and you're done" is the perfect approach, exactly what's wanted. In general, individual "artisan-type" bakers stay away from this sort of thing entirely, and aren't interested in duplicating it. If you are "a bit of both", then I'm supposing that there is no guide for you and it's up to you to carve out your own path. But hopefully there are other "bit of both's" who share your experience and can advise. not KA. They are a good company, they offer all that information for free AND you can call and message them and get solid advise. I don't think they are the typical greedy commercial establishment. ... when I talked about jumping to the quick pre-packaged solution - I meant industrial bakeries. ... in business to make a profit, the same as anyone. But if they do so without the greed and dishonesty that have sadly become the norm, then I applaud them for that. 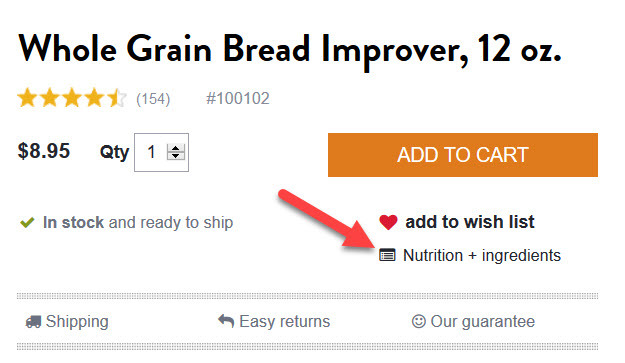 You can find the ingredients and more information on these additives like "Whole Grain Bread Improver" on their homepage under shop. All products list the ingredients and nutrients. They often also give you a substitute under tips. PS: You can also leave them out. I have done so many KA recipes and had only success. Mostly they state "optional" anyways. Very generally speaking, many dough conditioners and additives are designed to overcome the limits of time. In a commercial production setting, time is money, and resting 1,000 dough portions until relaxed enough to shape means you've got either people or equipment sitting around unused. So you can understand why a high volume commercial bakery might choose to add various things to manipulate rising or relaxing times. Often, these additives give a very specific texture/taste/consistency to a baked good, and some greatly extend shelf life. King Arthur does the home baker a service, IMHO, by providing very small quantities of things usually only sold in 50 lb bulk. If you're trying to get the exact taste and texture of a Cinnabon, for example, you might need a little additive assistance. Or if you're trying to make a huge batch of something in a narrow time frame, for a big bake sale, charity dinner, etc. Or if you're shorthanded, and Additive X will give you a longer working window with the dough. When you're the baker in your kitchen, you can decide what's important. If you don't like additives, don't use them. RE: sourdough, unless you're an impatient person, there is never any reason to buy small quantities of starter. It's flour & water & time. Again, if you've got 7 grandchildren coming this weekend to bake bread and your starter died, you may happily purchase some to ensure that no one is disappointed. People are free to buy or not buy as their needs fit. I prefer a marketplace where many things are available to me in quantities small and large.